Blockchain technology is “transformative”, according to Usama Fayyad, chief data officer at Barclays. Speaking at SWIFT Business Forum London, Fayyad explained that he believes bitcoin is interesting, but argued that it may not remain the most compelling use case in the future. “Underneath [bitcoin] lies the technology of the blockchain and I think that will be transformative,” he added. 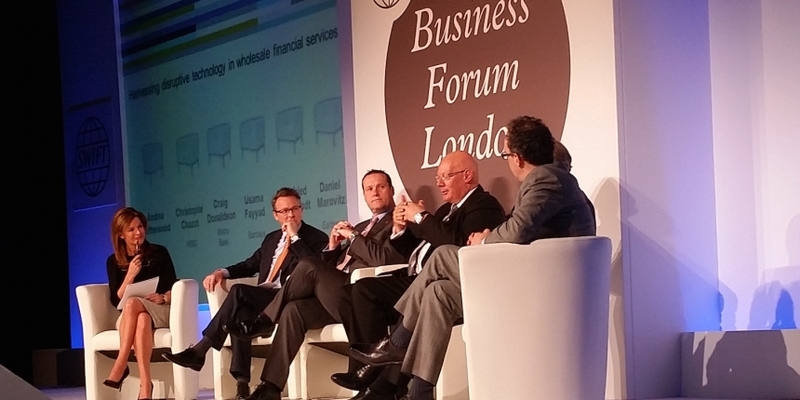 Fayyad took part in a panel discussion titled Harnessing disruptive technology in wholesale financial services, which featured Craig Donaldson, CEO of Metro Bank; Gottfried Leibbrandt, CEO of SWIFT; Christophe Chazot, group head of innovation at HSBC; and Daniel Marovitz, president of Earthport’s European division. Fayyad expressed interest in the idea of a distributed and secure ledger that can facilitate the exchange of contracts and information while providing the equivalent to a digital signature. He believes the integration of such technology with traditional banking infrastructure “will happen”. Marovitz echoed Fayyad’s views and explained that Earthport, which provides white-label cross-border payments services to banks, is working to figure out how exactly the distributed ledger concept can be used to improve his company’s operations. Earthport is already working with Ripple Labs to use its distributed consensus protocol for cross-border payments. Marovitz suggested that the main issue is finding a way to merge the compliance processes that exist in traditional banking infrastructure with this new technology. “When we’ve built those those bridges, I think incredible things will happen,” he said. Marovitz went on to state that the blockchain is a “major source of interest for us and major location of [our] investment and energy”. Donaldson, CEO of Metro Bank, said he has talked with bitcoin companies and agrees with Marovitz that the current struggle seems to be fitting this new technology with the current expectations surrounding financial compliance rules. “I think the technology is massively interesting, [but] the ability for those organisations to flourish is somewhat hampered at the moment and will continue to be,” he added. HSBC innovation chief Chazot stressed that, while the blockchain could indeed be useful within the traditional banking sphere, it is merely one part of the concept of a distributed database. He suggested there are plenty of other technologies that are worth exploring, and that blockchain technology may be useful for some applications, but not for everything. “The danger is people … will try to apply blockchain [technology] to everything, [but] you can’t apply one solution to everything,” he concluded. Chazot’s views mirror those of Mariano Belinky, managing director at Santander InnoVentures, who said in an interview that he doesn’t believe bitcoin is capable of eliminating all industry problems. “Think of bitcoin as a hammer. If you are going to have people walking around with hammers to treat everything as a nail, that’s a problem because you are going to break a lot of things,” he told CoinDesk.